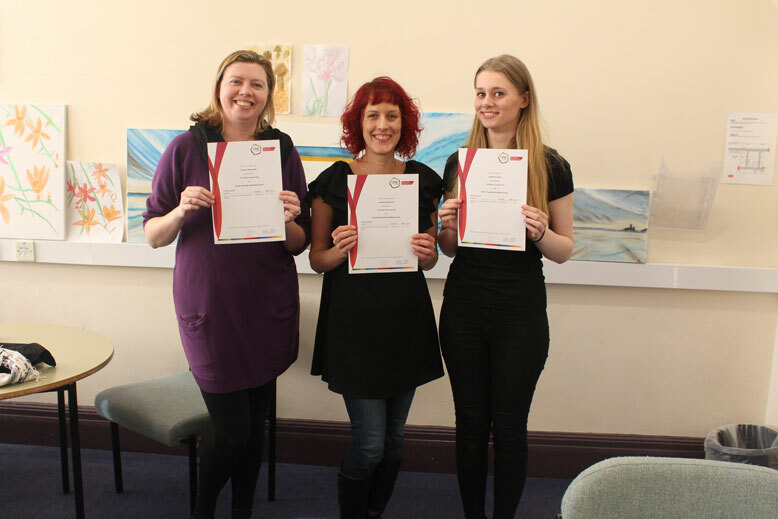 North Tyneside Disability Forum celebrated learners achieving One Awards Level 2 Certificate in Speech To Text Using Voice Recognition Software. Speech To Text is a communication system used whereby the spoken word is displayed on a screen via an operator so that anyone attending for instance a particular meeting, conference or lecture can read what is being said, this is especially useful for deaf and hard of hearing people who may either not hear or mishear what is being said. Pictured Left to Right: Joanne Somerville, Emma Hindmarch and Sophie Graham. Also receiving a certificate though not in the photo was Louise Raynor. The year long course, consists of six learning outcomes. These were divided into six assessment criteria, which included underpinning knowledge, such as recognising different types of deafness and identifying relevant communication methods of deaf people. There was also a demanding practice element to the course in which learners were supported in experiencing speech to text operation in a variety of settings and situations. Ultimately learners were set a practical assessment in which they needed to demonstrate an accuracy recording of 75% or above to achieve their Level 2 certificate. We would like to congratulate all of our Level 2 learners and wish them luck in their pursuit of Level 3 Speech To Text Using Voice Recognition Software.